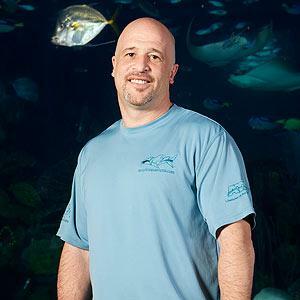 Brett Raymer was born on the 25th October 1969, in Brooklyn, New York City USA, and is a television personality and businessman, best known for his appearances in the TV series “Tanked” (2011- ) which is airing on Animal Planet. Raymer is also a successful co-owner of “Acrylic Tank Manufacturing”, and has a shop in Las Vegas; both parts of his professional life have helped him greatly to increase his net worth. Raymer’s career as a television personality started in 2011. Have you ever wondered how rich Brett Raymer is, as of mid-2016? According to authoritative sources, it has been estimated that Raymer’s net worth is as high as $5 million. In addition to having his show on Animal Planet, Raymer also generates considerable money from his company’s manufacture of primarily fish tanks. Brett Raymer attended the Abraham Lincoln High School where he played football, tennis, and was a member of the swimming team. After matriculation, he moved to Las Vegas with his family to establish a tank-building shop named “Acrylic Tank Manufacturing”, one of the most successful aquarium companies in the world today. Wayde King is Raymer’s partner and his brother-in-law, and they came to the idea of founding the company ATM. They were friends before King married Brett’s sister Heather, and now they’re all in the “Tanked” business. The rest of the family also appears in the show. “Tanked” first aired in August 2011, and is still running. The series follows “Acrylic Tank Manufacturing” operations, in which Wayde and Brett have the lead roles as co-owners. Heather is an accountant while their father Irwin Raymer is the office manager. Robert “Robbie Redneck” Christlieb is the shop manager, and the sales coordinator Agnes Wilczynski, and they are the other regulars in the series. The series “Tanked” has so far aired for nine seasons and 85 episodes, the latest concluding in January 2016. Known for his abilities to bring in new customers, Brett is a very popular and ambitious entrepreneur. His most famous customer was actor David Hasselhoff, who even appeared in one episode of “Tanked”. The tanks they build and the fish they’re showing are beautiful and amazing. Although the comedy and pranks are sometimes apparently acted or scripted, it’s still a very popular show. When it comes to his personal life, Brett Rayner has been in a relationship with Trisha since 2011 and has two children; Kayla and Bryce. A former athlete in high school, Rayner is now playing volleyball in his spare time, and he is also working as a coach of his daughter’s volleyball team. $5 million 1.93 1978-04-29 91.63 America's Cutest (2009) American Brett Raymer Brett Raymer Net Worth Brooklyn California Camarillo David Hasselhoff Director Kayla and Bryce New York City USA October 25th 1969 Tanked (2011) The Jeff Probst Show (2012) The Tonight Show with Jay Leno (1992) Trisha U.S.